Updated with details from the exhibition opening. SALEM – Were slaves allowed to get married? 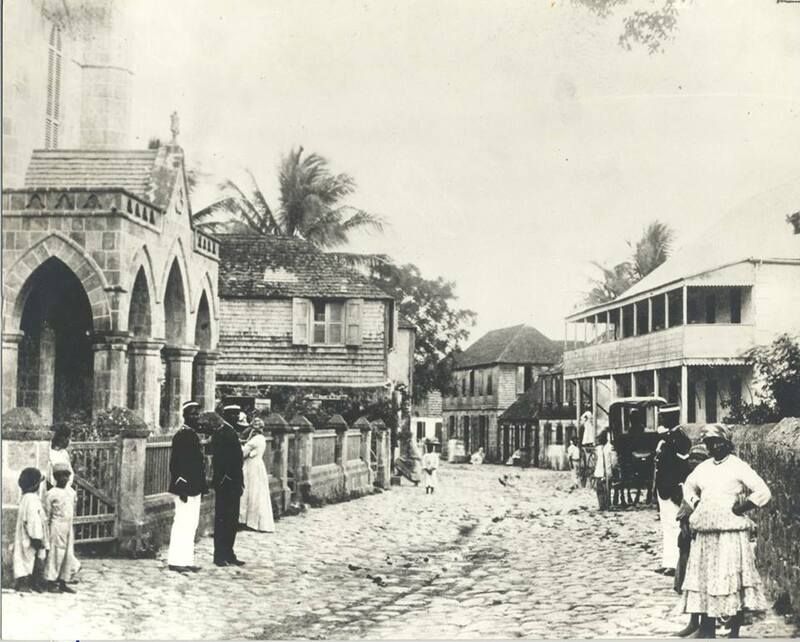 Who owned the various estates on island? How did Plymouth look before the volcano? These are questions which can be answered in the new exhibit which opened on Tuesday, March 10, 2015 at the Montserrat National Trust (MNT). Present were His Excellency the Governor Adrian Davis and Mrs Sujue Davis, Hon. Premier Donaldson Romeo and Hon. Minister Claude Hogan, Hon. Parliamentary Secretary Gregory Willock, and head of the St. Patrick’s Festival Committee David Duberry. President of the MNT Board Ms Dulcie James expressed the critical nature of the work which needed to be done to save the island’s history. This was echoed by the premier in his remarks as he encouraged the Trust to look at ways the archives can be used to educate the nation’s children and also become a source of revenue for Montserrat. Reigning Miss Montserrat Sharesa Ryan who performed a traditional song from The Rude Boys “Gimme soup in a one calabash” on violin, told the audience she was looking forward to the exhibition as it would bolster her knowledge on the island’s history and enable her to speak more confidently about Montserrat, since she left here as a very little girl. Aw eHeritage: A Digital Approach to Preserving Our Heritage is the title of the exhibition scheduled to run for two weeks at the Trust’s offices in Salem. Aw eHeritage (pronounced: aw we Heritage) is the colloquial way of saying Our Heritage. According to the MNT Director Mrs Sarita Francis, slaves were able to get married. An 1822 document from a local church shows the first names of slaves who were married on a plantation. Most slaves did not have a last name and later adopted the name of their masters after the abolition of slavery. The church document was able to be preserved as part of a three-month digitization project done in partnership with the British Library. The vision is to digitize all of the documents including those housed at the National Trust, the Public Library, Lands & Survey and the Registry. Some government departments are currently conducting smaller digitization projects but Francis believes that a joint and concerted effort must be made to save the documents, provide proper storage and develop a national archive so the information can be available for people to access. Montserrat has seen its share of disasters including earthquakes, floods, the 1989 hurricane and the volcanic eruptions of the late 1990s and early 2000s which caused the loss a significant amount of the island’s documents. Over the coming weeks residents and visitors will be able to see some of the documents which were saved during the project. Mrs Francis said the exhibition will show the public how the documents and images can be used to develop videos and other live and interactive products to tell the island’s story. The exhibit is a combination of mounted photos, videos, slide shows and samples of the books, deeds, and legal documents which have been preserved.